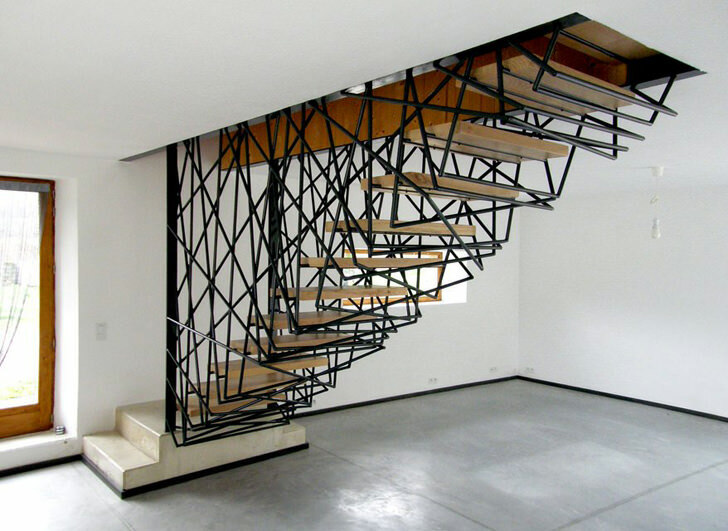 Here are 12 amazing and creative stairs made out of wood, steel, and concrete. I have to admit, some are pretty frightening to climb. Those without hand-rails, I wonder how they complied with building codes. 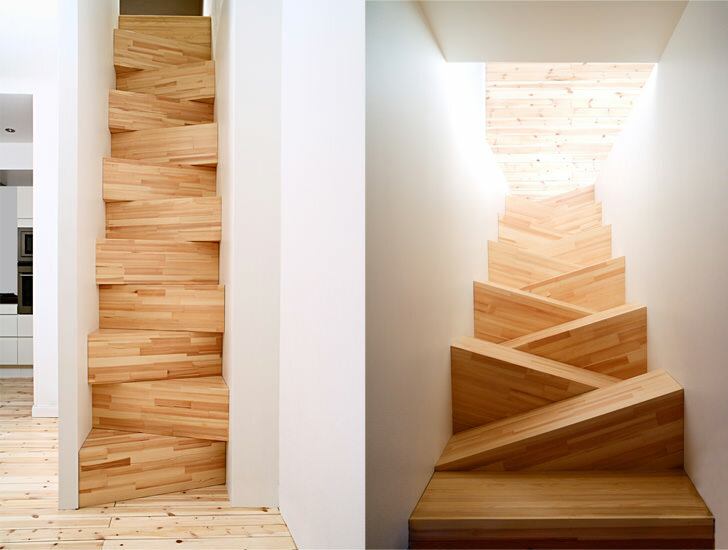 Without further ado, here are the 12 creative stairs ideas for your future projects. When you’re drunk, this stairs will appear normal. 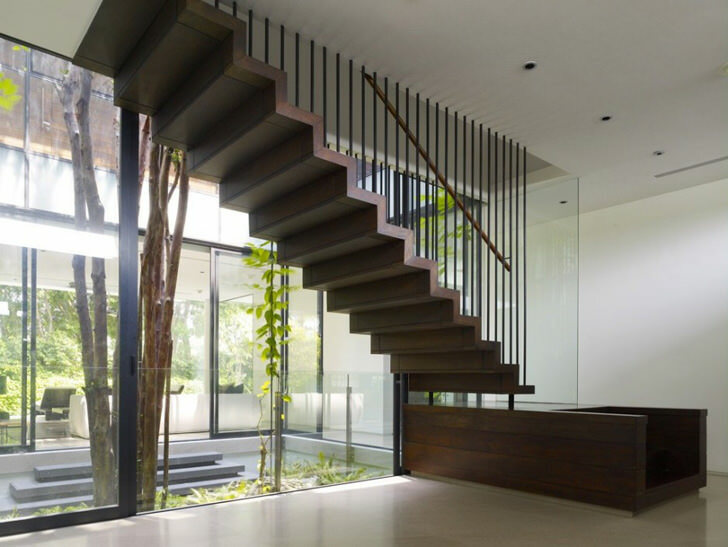 Designed by Atmos Studio, the stair is a continuation and intensification of the simple graphic skirting board lines that trace their way through the house. As they turn the corner into the stair void, they expand like a genie released from a lamp, curling and separating and bifurcating from the wall to form the delicate edge of the stair treads, lifting into the air to rise as the veil of the balustrade. Designed by nC2architecture. Two custom designed loft beds carefully integrated into the bedrooms of an apartment in a converted industrial building. 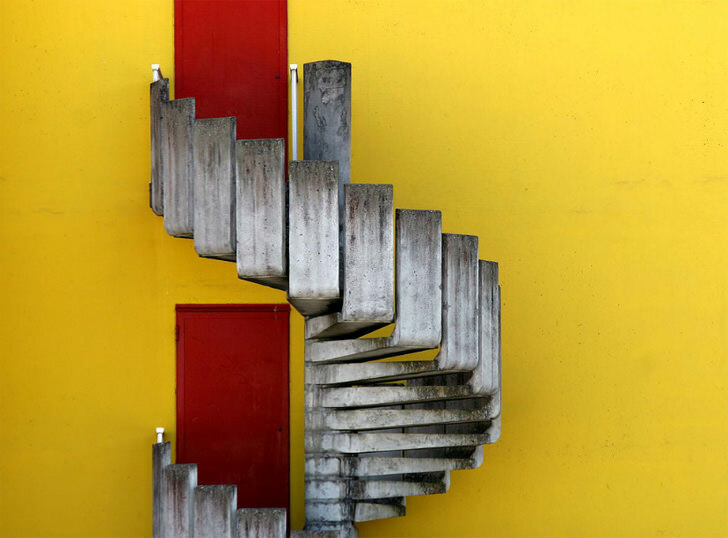 The alternate tread stair was designed to be a perfect union of functionality, structure and form. 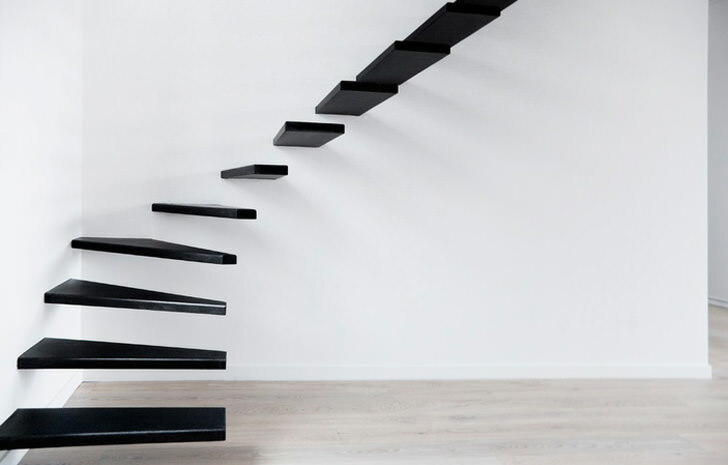 With regard to functionality, the stair is comfortable, safe to climb, and spatially efficient; the open sides of the stair provide ample and well-placed grip locations. With regard to structure, the triangular geometry of the tread, riser and stringer allows for the tread and riser to be securely and elegantly fastened to a single, central, very minimal stringer. 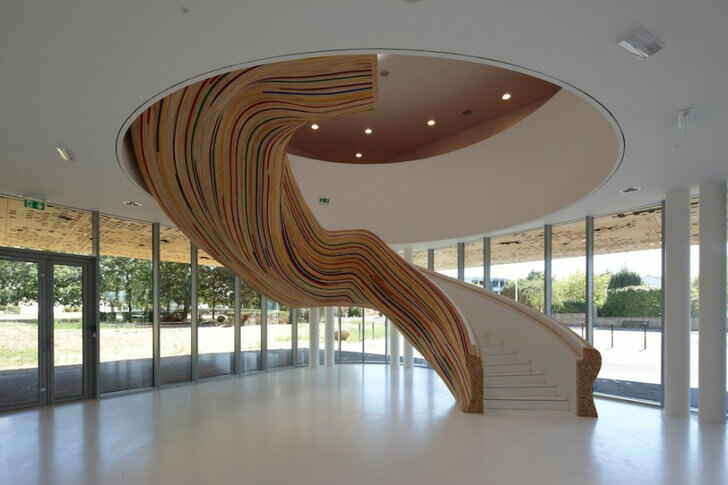 Designed by the Architectural firm Schlosser + Partner, this steel cantilevered stairs that look like a ‘continuous’ ribbon of steel is located in northern Graz, Austria. Photo by Croce&Wir. 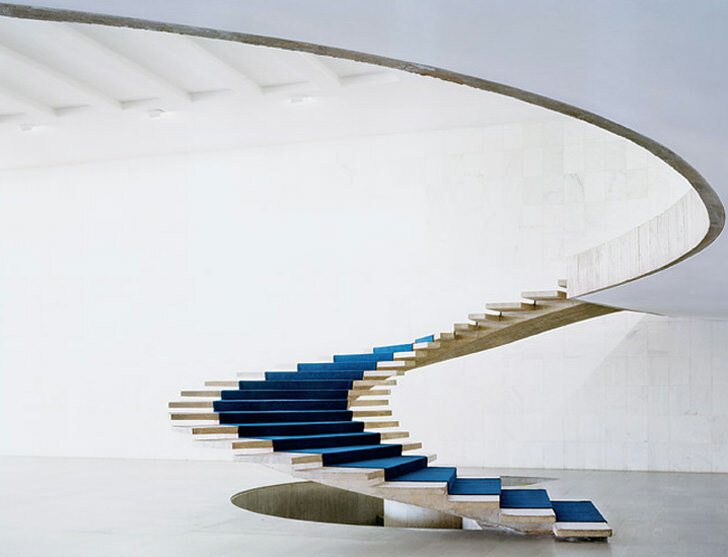 Brazilian architect Oscar Niemeyer, this amazing ‘continuous’ staircase is located in the Ministry of Foreign Affairs in Brasilia. Photo by Simon Norfolk for The New York Times. 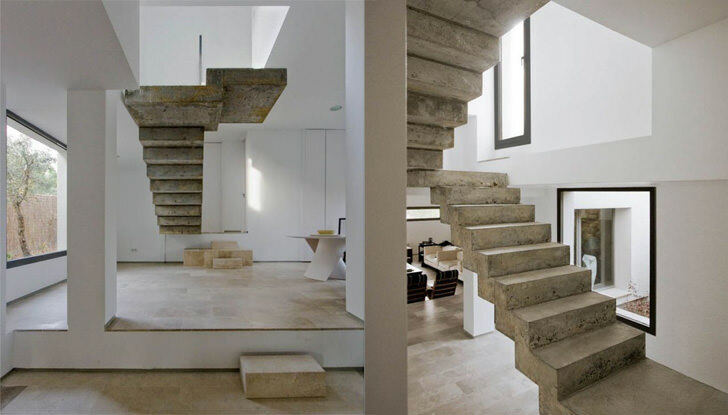 Floating concrete stairs by Ábaton Arquitectura of Spain. 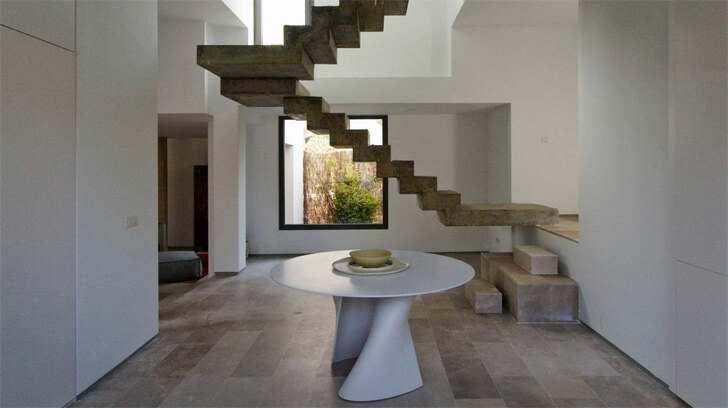 As shown in the photos, the brutal concrete finish of the stairs is a striking contrast between smooth surface of the white walls and polished floor, speaks volume of the message intended by the architect. Located in Stockholm, Sweden. 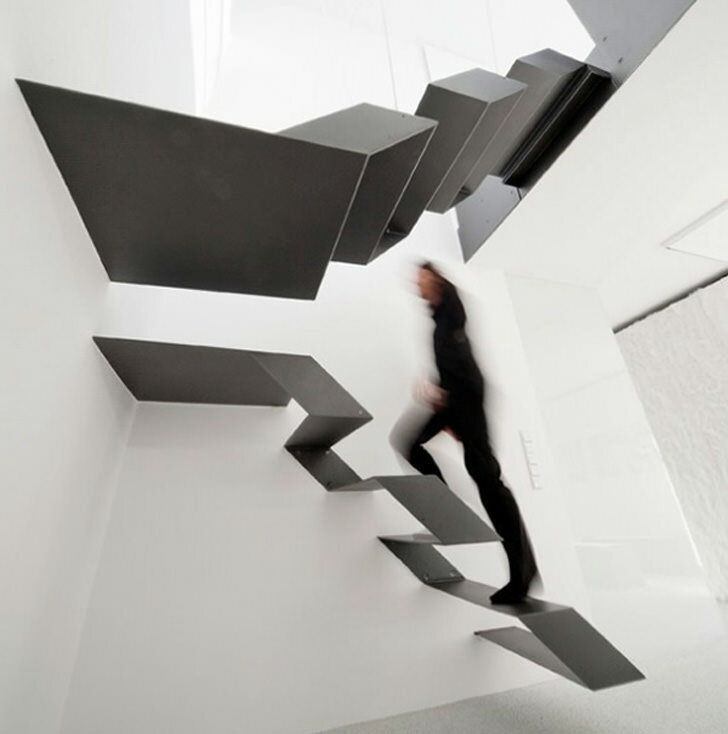 The stairs was designed in such a way due to space constrain in a small private residence. Designed by TAF Gabriella Gustafson & Mattias Ståhlbom. Photo by Bobo Olsson, 2006. This is a low budget project made out of stacked boxes of pine. The cut out between the ground floor and the attic was to narrow to construct a regular stair. We had to put each step angled to get the right amount and height of them. It is well-functional and exciting to walk cause of the extra steepness. Designed by Levitate Architects. 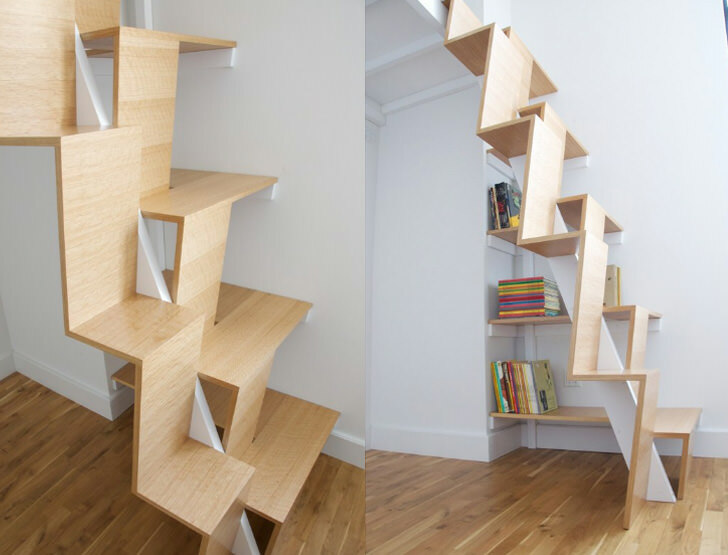 Due to limited by space, the designers melded the idea of a staircase with their client’s desire for a library to form a ‘library staircase’ in which English oak stair treads and shelves are both completely lined with books. 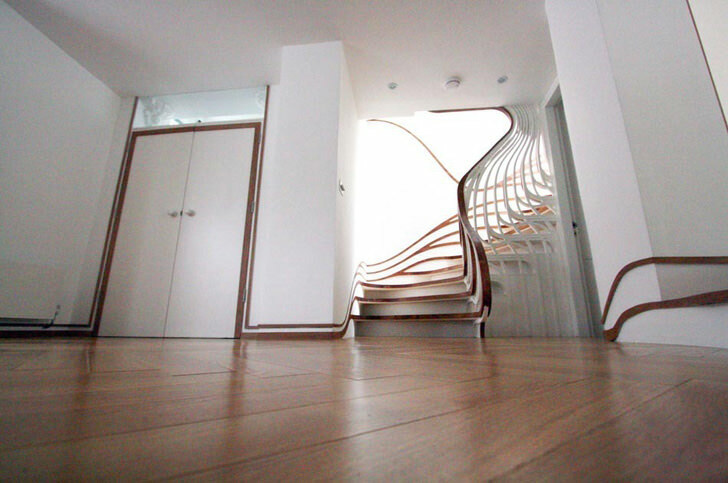 Amazing staircase design discovered in this blog. When it comes to adding decoration to our home’s with newest staircase design, we might be pleased to learn that there are actually a number of ways we can achieve this in a tasteful way that works with our theme. 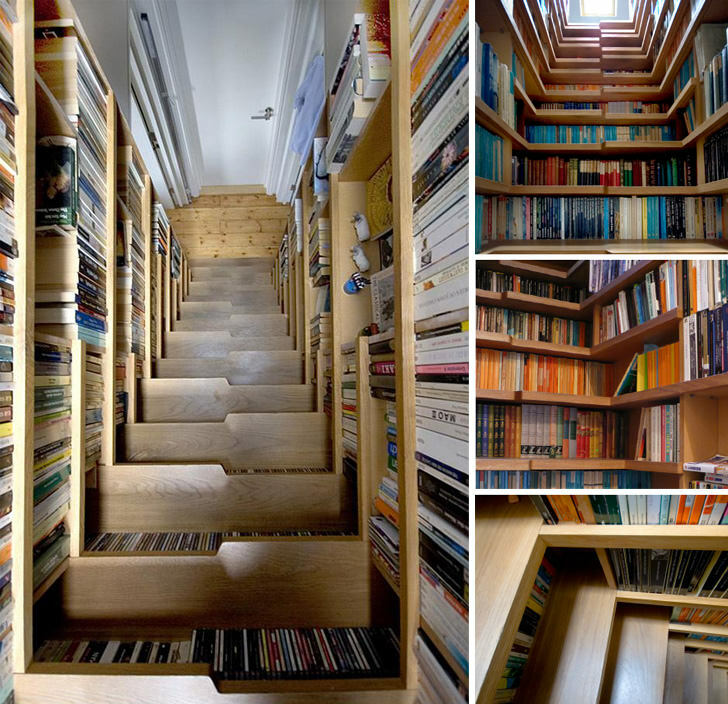 Mind blowing ,awesome stairs , i should want to say only that,The words can’t express this creations . just beautiful and beautiful……………………. 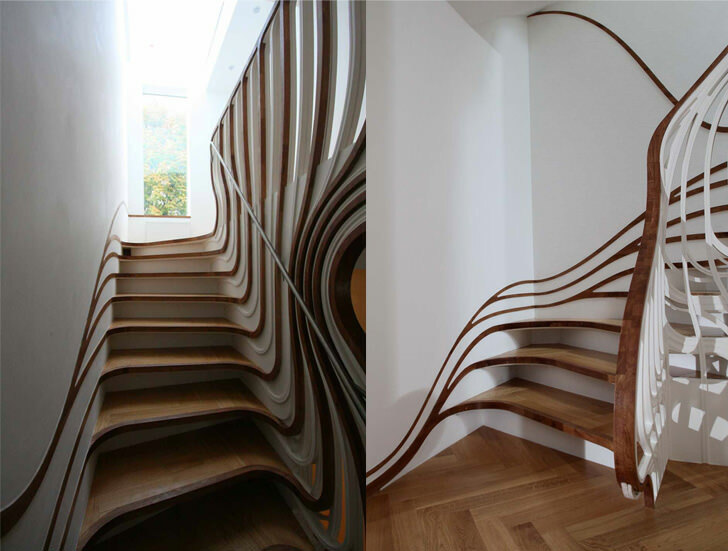 Nice Staircase designs all are unique and wonderful. Recently I ordered a wooden spiral case thanks to from my favorite store “stairs-interiors” its designs are awesome.